Some time ago, I used some leftover chicken that had been red-cooked by poaching in my Chinese Master Sauce and deep-fried it to very a very delicious result. Since then, I have wanted to try the same technique with a western style poaching medium and my ongoing Firepot Stock seems an ideal choice for this experiment. 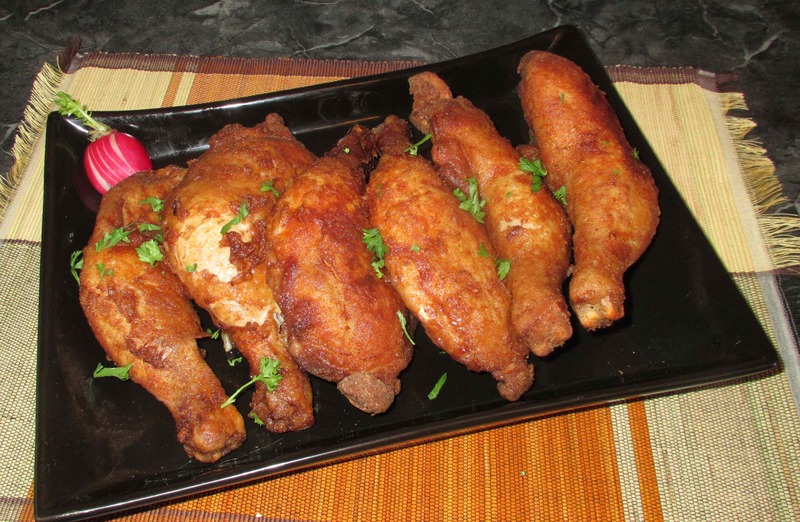 By the way, the notion of poaching chicken prior to either grilling, roasting or deep-frying is hardly my own, but when I was researching for this experiment, I could see that there is some controversy over the practice. One camp hails it as a great technique, while another claims that it robs the chicken of flavor. In truth though, many of those who have voiced opinions one way or the other seemed mostly to be talking about boiling the chicken, even when they used the term poaching, and it is true that chicken, or indeed any meat, when subject to boiling for much more than 15 minutes or so will start to lose a lot of flavor to the water quite quickly. However, when poaching (a distinctly more gentle process), this need not be the case. The Chinese dish known as ‘white-cut chicken’ (白切雞) poaches the chicken at near boiling for just a few minutes before turning of the heat and letting the meat cook to completion. This results in very tender, juicy, and eminently flavorful chicken and is pretty close to the process I will be following here. 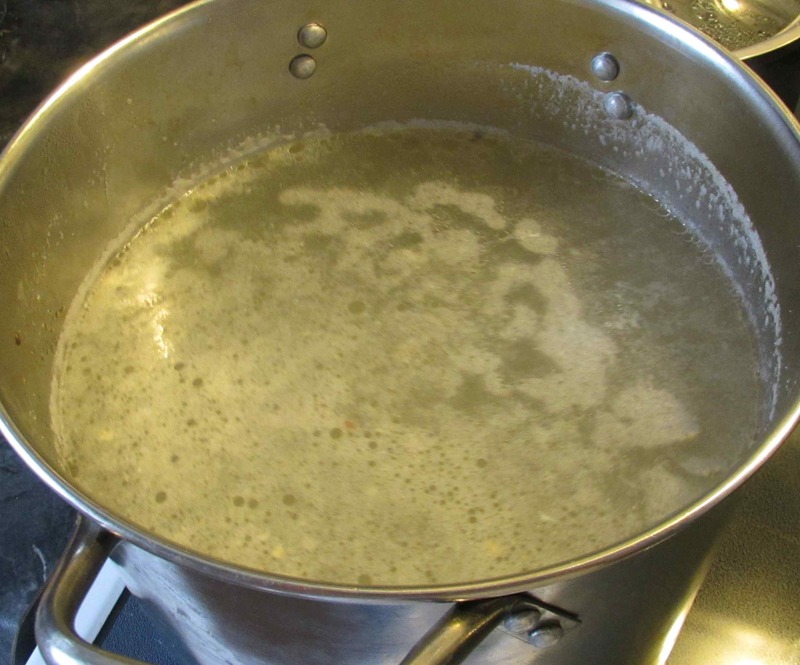 The first step, as is always the case when I add meat to a stock-pot, is to blanch it quickly in boiling salted water for just a minute or so. If you look at the pot I used to do this in the above picture you can see the reason why. The blood and matter that is given off forms quite a heavy scum that will cloud your stock or, at the very least, require you to do considerable skimming. Here, the chicken can be fished out of the blanching water and rinsed off well under cold water before going into the stock. For the poaching, I brought the stock to almost the boiling point and then added the chicken. In a slight departure from the Chinese technique (which often leaves the meat pinkish near the bone) I then turned down the heat and continued to poach at a level where the water was steaming slightly but had no ripples at all on the surface. After about 15 minutes, I then took the pot off the burner, covered it, and allowed the chicken to cool, and then steep, in the stock. Had I been using a whole chicken, or much larger pieces than the ones I selected, I would have poached on the heat for a little longer, but 15 seemed minutes just fine here. 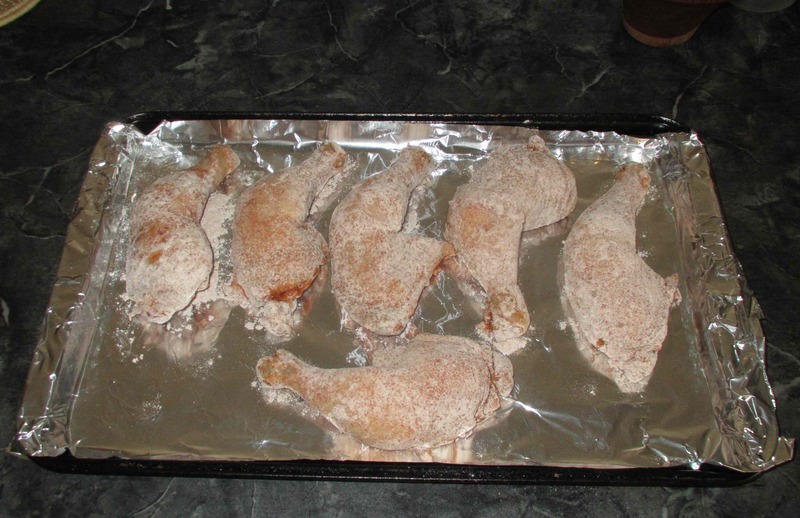 I couldn’t decide whether to batter the chicken or else simply coat with seasoned flour. In the end, a bit of laziness decided the issue and I went with the latter. I used a cup of flour mixed with 1 tablespoon of paprika and 1 teaspoon each of salt and pepper. At another time, I might jazz things up a bit more with some herbs or other spices, but I wanted to taste the flavor of the meat without anything else getting in the way too much. After tossing the chicken pieces, I let them sit for about a half an hour. There was no magic in the frying procedure. I kept the oil at medium and fried the chicken pieces just until the coating was nicely golden and they were heated through. I served the chicken with fries and coleslaw and then forgot to take a picture of the plated meal. The chicken was certainly moist and tender and the taste was very pleasant. It was not, however, markedly better (nor, for that matter, any less flavorful) than plain fried chicken. I am also a little embarrassed to report that the meat was just a little pink right next to the bone so my 15 minute poaching estimate was a little short. Twenty or twenty-five minutes would have been better. 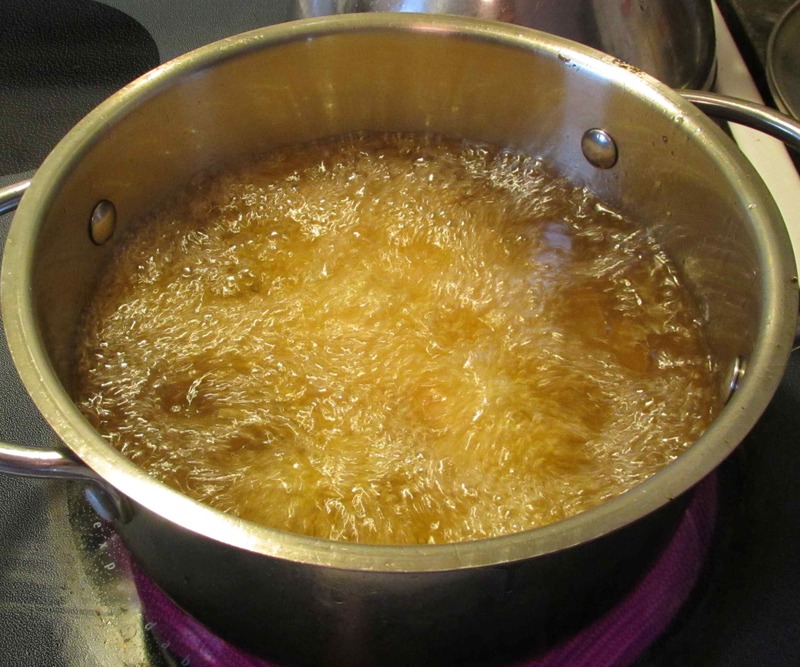 All in all, as far as I can see, the only real advantage to pre-poaching is that it makes the frying job a lot easier and would thus be a benefit if one was cooking for a large number of people. Still, it was an interesting experiment and I think I may try the pre-poaching with chicken destined for the barbecue. I wonder if poaching the chicken for a little longer in the Firepot Stock would have served both purposes – reduced the pinkness near the bone and infused more flavour into the finished result. Yes on the pinkness …. probably not so much on the flavor (I think). Interesting experiment. I’ve done fried chicken that was precooked sous-vide with good results. I remember it helped to use baking powder and some drying time to get it more crispy (more details in a post on my blog somewhere). As for the chicken losing flavor, I think that also depends on the stock. 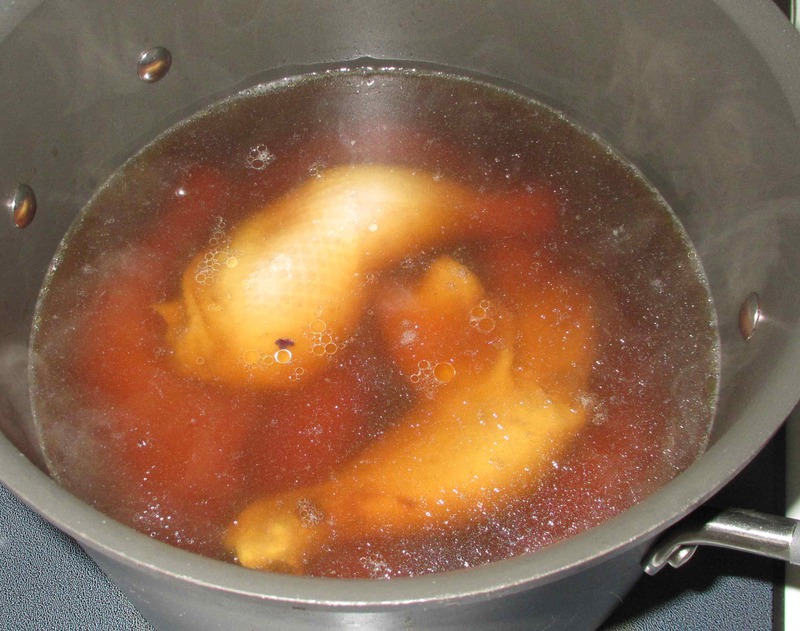 Due to the laws of diffusion (although that is not the only thing at play) you can expect chicken in water to give off flavor to the water, and chicken in heavily flavored stock to take up flavor from the stock. I do believe that the main advantage of precooking chicken before frying is that you can fry larger pieces of chicken without having to worry about undercooking them (if the precooking was long enough, obviously). The trick, of course, is to get the best balance of flavor transfer. I think I generally achieved this… although some tweaking could probably produce better result.